GW has planned a three-day, roughly $500,000 spectacle to celebrate the official start of University President Thomas LeBlanc’s tenure this week. 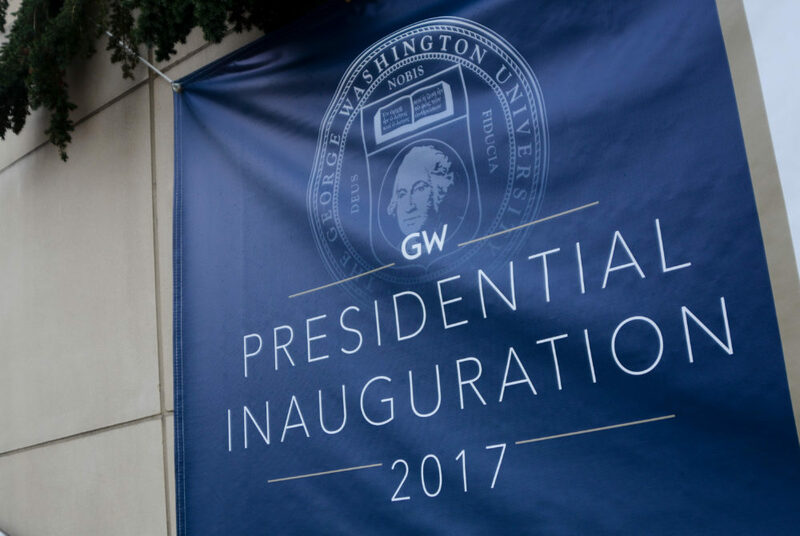 As University President Thomas LeBlanc prepares for his inauguration Monday, officials are hoping to turn the event into a showcase of GW’s achievements. The University has planned a three-day, roughly $500,000 spectacle to celebrate the official start of LeBlanc’s tenure by highlighting GW’s strength in research and its prime D.C. location. Officials said the week’s events, which include a solemn academic ceremony and a celebratory academic showcase, are a rare opportunity to reflect on GW’s rise as an institution in recent decades and for LeBlanc to outline his vision for the future. LeBlanc is just the 17th president in GW’s nearly 200-year-history. The last presidential inauguration was held a decade ago when former University President Steven Knapp began his tenure in 2007. Knapp stepped down from the role last summer. A 29-member steering committee chaired by Board of Trustees Chairman Nelson Carbonell and led by Lorraine Voles, the vice president for external relations, has met three times over the last several months to plan the week’s events. The committee includes representatives from offices across the University including marketing, media, security and events and venues, as well as faculty and trustees. The festivities began Sunday with a student brunch on the Mount Vernon Campus. LeBlanc, who talked about connecting the Vern with the rest of the University during a town hall there last month, said the location was deliberately chosen to connect the campus with the rest of the celebration. LeBlanc and his family also attended a small private dinner at the Supreme Court Sunday night hosted by Carbonell and Justice Elena Kagan, Voles said. The official inauguration ceremony will begin at 10 a.m. Monday in the Smith Center, featuring speeches from Carbonell as well as student, faculty, alumni and staff representatives including Student Association President Peak Sen Chua and Alumni Association President Venessa Marie Perry. More than 100 universities around the world are sending delegates to march in a formal procession. LeBlanc, who has been serving in the role since August, will officially receive his president’s medallion at the ceremony, which serves as a symbol of his office. In his inaugural address, LeBlanc said he would tell the history of GW, a University that began with the vision of George Washington but initially had “no money and no campus.” He plans to highlight how the school went from simply trying to survive in its first century in existence to a University with a global reputation, he said. Following the ceremony, Voles said the University will hold a “raucous” celebration in the Science and Engineering Hall featuring musical performances from student groups. The eight floors of the hall will be filled with academic displays from schools across the University and an exhibit with George Washington’s 1789 inaugural bible. The displays will include robotics demonstrations, highlighting the University’s rising focus on engineering and technology fields, and a collection of artwork from the Corcoran School of the Arts and Design, which GW absorbed in 2014. LeBlanc said it was fitting to hold an event designed to display GW’s academic prowess in SEH – the University’s $275 million home for STEM programs. Then on Monday night, more than 200 guests including LeBlanc’s family and friends, administrators, student leaders, faculty and donors will head to the Library of Congress for his inaugural dinner. Tuesday morning, Frank Sesno, the director of the School of Media and Public Affairs, will interview LeBlanc at a livestreamed town hall in Jack Morton Auditorium. LeBlanc said the event will be a chance to involve alumni in the inauguration and allow former students to hear his thoughts about the University. The events conclude Tuesday afternoon when LeBlanc hosts a faculty reception at F Street house, his campus residence. Michael Peller, the associate vice president for events and venues who planned most of the events, said his goal was to personalize the celebration. Michael Freedman, a professorial lecturer in the School of Media and Public Affairs and former vice president of communications at GW, led the committee that planned Knapp’s inauguration. “Inaugurations are an event where the community can come together meant for student faculty staff alumni major donors help reinforce values of an institution, welcome a new president, reflect on University’s accomplishments and challenges,” he said. Freedman said universities spend a lot of inaugurations with the goal of creating a campus-wide event designed to make members of the community feel proud of their university. Rebecca Downing, senior director of Communication initiatives at Colgate University, said there is extensive marketing towards students, faculty and alumni to promote university presidential inaugurations. The University has marketed the event significantly to students and faculty in recent days through emails and signs posted around campus. Downing said students can feel disconnected from a university’s leadership and might feel that their time is better spent engaging in other activities rather than attending an inauguration. But she said students should try to attend inaugurations because a strong student presence shows that students are engaged in the big moments at a university.